Vail Mountain School's Emma Hall ties it up against Liberty Common on Saturday, May 12, during the second round of the 3A state playoffs in Flort Collins against Liberty Commong. The Gore Rangers went on to beat the Eagles, 2-1. 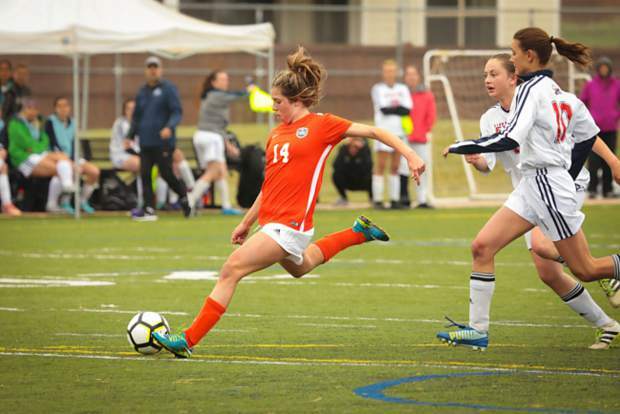 FORT COLLINS — Oh, alas, the Vail Mountain School girls soccer team just seems to be screwing up the 3A state soccer tournament. The second-to-last team to qualify for said tournament just doesn’t know its place as the No. 23 seed really shouldn’t be in the quarterfinals, but here are the Gore Rangers after second-half rally lifted the orange to a 2-1 win over No. 7 Liberty Common on Saturday, May 12, in Fort Collins. VMS soccer is often portrayed as the little engine that could, but it might just be powerful locomotive as it heads to No. 2 Colorado Academy for the Elite Eight on Wednesday, May 16. Alonzo was speaking from Denver International Airport, where she was flying out for her brother’s graduation from Rollins College in Florida on Sunday, May 13. With a little help from the rest of the Gore Rangers, Alonzo was able to get her flight changed so that she could see Harrison, VMS Class of 2014, walk. And she would like her peanuts on the flight. It’s the least that could be done for state quarterfinalist. VMS fell behind the host Eagles, 1-0, on an early goal, as the Gore Rangers were not yet on the same page. While the Gore Rangers were starting to see signs of better play, it really came together at the half. VMS talked about two things at the break. The team wanted to play wider — not a surprise — and playing up into the midfield — also not a shock. A staple of VMS soccer from the beginning of time is getting the center back or backs to play up into the midfield to press forward, giving the Gore Rangers a numerical advantage in the other team’s end. And on Saturday, that was Sammy Gish. And “one mind” just happens to be the slogan on the team’s playoff t-shirt. It’s not a coincidence. With Gish playing up, and Alonzo (knee) providing valuable minutes at midfield, the Gore Rangers dominated possession. It was just a matter of finding the net. And it wasn’t because of what Bandoni called an “incisive” pass from Alonzo to Hall. The translation of Bandon-ese is that Alonzo’s pass split two defenders and got to Hall in perfect order for a one-timer and the equalizer. And playing wide bore fruit on the game-winner as Marley Chappel served the ball in from the left to Hall, who slotted it into the left side. With the win, the Gore Rangers get a rematch with Colorado Academy. The Mustangs dispatched VMS, 5-0, in last year’s Round of 16, and, perhaps, the Gore Rangers remember that. Throw in that Tess Johnson might be returning from her U.S. Ski and Snowboard Team obligations, and the poor, little Gore Rangers might just have a fighting chance against CA.